A last look at the partially collapsed Rokko Bridge (on our left) and the new bridge being constructed on our right. Geotechnical engineers often measure the width of cracks on the river bank to determine how much lateral spreading occurred during an earthquake. However, if there was lateral spreading at this site, it must have occurred in the middle of the lake. Perhaps there was just a loss of bearing capacity during the earthquake that allowed the pile bents to sink below the water's surface. My feeling is that this is an old, locally owned bridge that wasn't designed or retrofit to the standards of Japan's highway bridges. 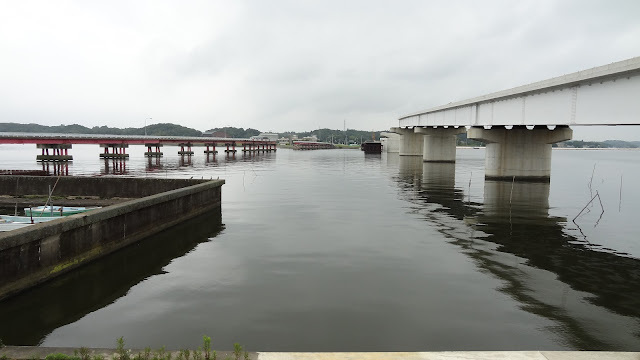 Ibaraki, Japan's Bridges: Rokko Bridge across Kitaura Lake (4) by Mark Yashinsky is licensed under a Creative Commons Attribution-NonCommercial-ShareAlike 3.0 United States License.